Best Laptop Cooling Pads 2018 | Top Rated Laptop Coolers to Buy Now! Are you also facing heating issues with your Laptop? Well, you’re not alone. The only option to save your laptop from overheating is to get a good laptop cooling pad. In this article, I have reviewed the best laptop cooling pads available in 2018 including cooling pads for Macbook as well. Also, I have included some secret tips at the end to cool down your Laptop. So, let’s begin. Laptops are being used widely for all sorts of tasks; be it gaming, video editing or just long hours of surfing. Thus, all laptops tend to heat after some time. I know most of us have had at least one of those days when the laptop just becomes a frying pan on which you can cook an omelet. Did you say Yes? LOL. Jokes apart. Actually, the stock coolers of most laptops are not meant for extreme conditions like these. And, it is a Laptop, not a PC where you can tweak around with different case fans and CPU coolers. So, we have to depend on a solution that does not include tearing your laptop apart and regretting it later. Enter, the Laptop Cooling Pads! In very simple terms, a Laptop Cooling Pad is a portable platform with cooling fans that control the temperature of your laptop. How? When you seat your laptop on a cooling pad, the fans work in a way that draws heat from your laptop and maintains a constant flow of cool air under your laptop. That’s pretty effective I would say. Recently, I decided to get my hands on some good laptop cooling pads and see if they work practically the same way too. I have tested all the cooling pads included in this post and gave my honest review on each to help you choose the perfect cooling pad for your laptop. 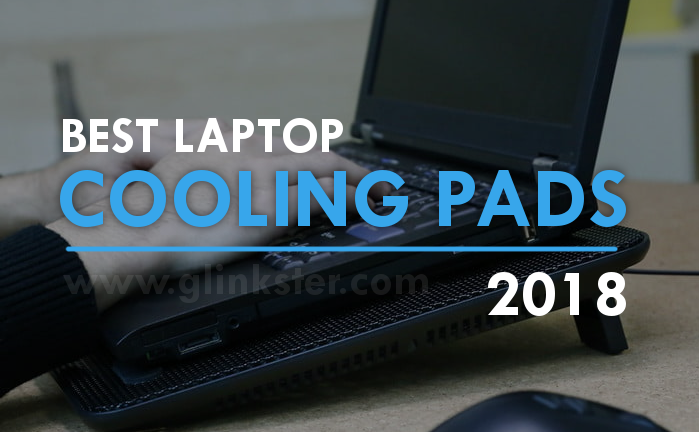 So, without keeping you waiting anymore, first of all, check out the list of best laptop cooling pads 2018 ranked according to their performance, durability, ease of use and affordability. In case you are in hurry, you directly make a choice from this list. Now, let me begin with the individual reviews of each of the laptop cooling pads listed above. Considering the fact that most us have laptops from different brands and different sizes, manufacturers produce cooling pads accordingly. Therefore, I have included cooling pads for laptops of all sizes. No matter you own a 17-inch gaming laptop or a MacBook Pro, you can find the best-suited cooling pad for your laptop among the ones I have reviewed below. Let’s begin. The very first choice for the best laptop cooling pad is the Cooler Master NotePal X-Slim. Giving you a nice blend of minimalism, ergonomics and performance, this laptop cooling pad excels at doing it’s real job. 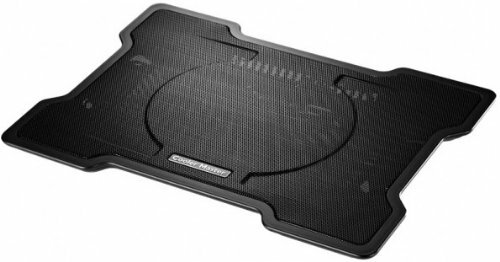 Cooler Master has made this cooling pad keeping Notebook PCs in mind up to 17 inches in size. That means it can easily seat your Apple MacBook Pro or Ultrabook and the smaller netbooks as well. Isn’t that awesome? The Cooler Master NotePal X-Slim is equipped with a high-performance 160mm fan which can go up to 1500 RPM to provide enough cooling that your laptop would require. So, you don’t have to worry about the temperatures while gaming or other resource hogging tasks. It is powered via a USB 2.0 cable which sneaks just perfectly in the built-in grooves giving a cleaner look. Cooler Master has used a significantly silent fan that makes around 21dBA noise even at such high speeds. I have been using it for a few weeks now, and it is not that audible to disturb you. The sturdy metal mesh top not only provides high airflow up to 70 CFM but also makes it quite durable. What surprised me about this one is ultra slim design and the weight; its only 1.5lbs (~700 g) which are extremely lightweight and easy to carry around. Talking about ergonomics, it offers a two height setup to better comfort for typing and viewing angle. Though there are no fancy LEDs or fan settings etc. 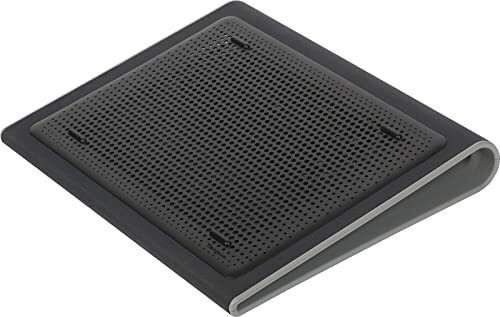 but if you are looking for a laptop cooling pad that you can use in your office as well as your home, this one is the right choice with elegant design and portability. Next up we have the Tree New Bee TNB K0025 laptop cooling pad. 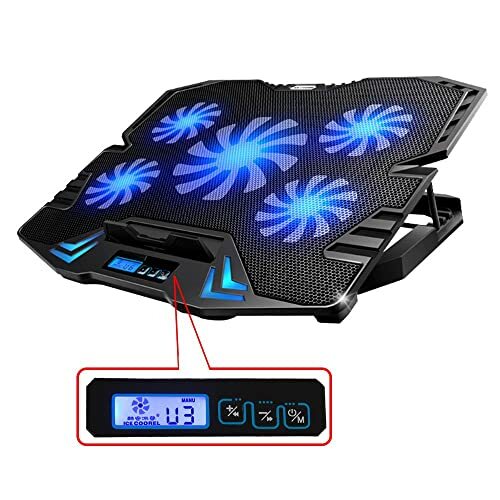 If you thought that the previous one was too basic, then this laptop cooling pad has all that you would want including multiple fans, LED lighting and adjustable fan speed. Apart from the weird name, the rest is just fine with Tree New Bee TNB K0025 laptop cooling pad. 😛 You get four 110mm fans offering a 75 CFM airflow which is quite enough to pull the excess heat out and maintain optimal temperature and prevent your laptop from crashing. 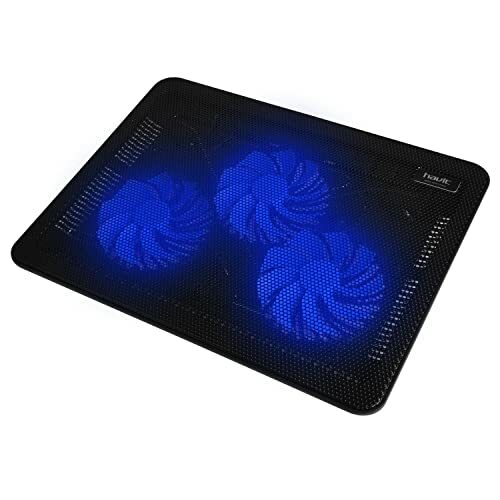 For gamers, this laptop cooling pad is definitely a treat. With the Neon LED lighting and edgy design, it is going to compliment your gaming laptop while simultaneously cooling it down efficiently. Also, while you are playing extreme games like CSGO etc. you can adjust the fan speed to keep your laptop performance at the top notch. And otherwise, you can tweak the speed for more silent operation. Tree New Bee has taken special care of the ergonomics providing pins at the bottom to adjust the correct height according to your comfort allowing you to work or play for longer periods. Also, on the top, there are two anti-skid arms that make sure your laptop stays in place. As a value add-on, Tree New Bee K0025 laptop cooling pad comes with an extra USB port to make it up for the laptop’s port occupied as a power source. So technically, you don’t have to sacrifice that one port. That’s pretty clever! Though the build quality could have been better, but with four fans, Tree New Bee Laptop Cooling Pad is an overall good choice as the best laptop cooling pad for gaming at this price. At third place on our list of best laptop cooling pads we have the Havit HV-F2056 ultra-slim laptop cooling pad. In this cooling pad, Havit has succeeded in giving you the taste of both the worlds with slim design and effective cooling. On top of that it’s aesthetically pleasing as well. The main highlight to this laptop cooling pad is the Low Noise. Equipped with three ultra-quiet 110mm fans, it produces low noise and high airflow. That’s one of the reasons Havit HV-F2056 is one of the most popular laptop cooling pads you will find the market today! You have an option to adjust the speed between 200 RPM to 1100 RPM according to the level of cooling required for your laptop. There are multiple vents along the edges and bottom to have better airflow and improved cooling efficiency. Along with good build quality, you will get one extra USB ports to connect more devices to your laptop. For the size, it is suitable for most common laptop sizes including 15.6” and 17” too. To adjust it according to your comfort during typing and otherwise, Havit HV-F2056 comes with two holders on the back that allow you to have two height levels. Weighing just around 1.5lbs and very slim design, Havit has focused on making it a truly portable, efficient and low noise laptop cooling pad for the next generation users. If you think 110mm fans aren’t big enough to meet your requirements, this next laptop cooling pad from Vanble should work for you. 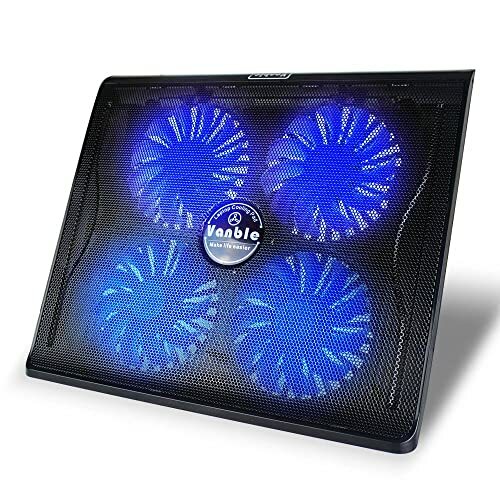 The Vanble Portable Laptop Chill Mat comes with large 120mm fans, not one or two but four of them. This is the maximum fans any laptop cooling pad can accommodate and still being easily portable. Though there are cooling pads with 5-fan setup available on this list, they are not easy to carry around. Talking about cooling, these four fans can run at a maximum speed of 1200 RPM. Before testing it, I was expecting great air flow and it stood right on my expectations with a significant decrease in laptop temperature. The design is very intuitive with multidirectional mesh for air flow and slightly upward curve at the front edge. It prevents the laptop skidding as well gives a modern look the whole setup. It also offers two adjustable height levels to avoid neck and back pain while long gaming hours. 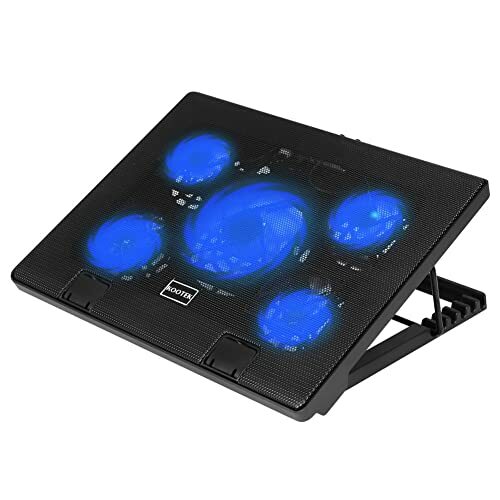 Vanble has branded this laptop chill mat for gamers with a blue LED lighting and superior airflow. The fan speeds can be adjusted according to the conditions using two knobs for each pair of fans. You will two bonus USB ports too. It is also one of the largest laptop cooling pads in terms of size, thus, being able to house laptops larger than 17 inches as well. 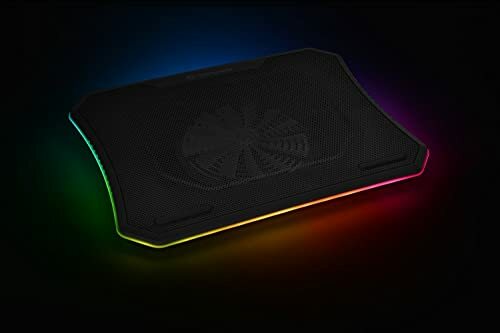 If gaming performance and portability are your priorities while buying a laptop cooling pad and you don’t want to empty all your pockets for it, Vanble Laptop Cooling pad is best budget laptop cooling pad for gaming. The next up is the beast of laptop cooling from Cooler Master which is known for its cooling solutions. I am talking about the Cooler Master Notepal X3, a more performance oriented cousin of Notepal X-slim. With the first look on this laptop cooling pad, you would think nothing but gaming! Cooler Master has designed it in a way that appeals to the gamers. As gaming laptops need more airflow, Cooler Master Notepal x3 comes with a giant 200mm fan. Yes! That’s how it rolls. In case you are thinking whether a single fan is enough, let me tell you it produces 76.5 CFM airflow single-handedly. Being a large-sized fan, it runs at a maximum of 850 RPM and being very honest it does produce an audible noise when running at its full potential. Technically, it is not possible to have a 200mm fan operate unnoticeably silent. Cooler Master Notepal X3 does support up to 17-inch laptops but practically a 17-inch laptop looks a bit weird-fit while a 15.6” one fits like a boss! The design is impressive as well as aerodynamic that improves the cooling efficiency by 20%. You also get superior build quality giving a solid base to your laptop. It has very well-though vent location at the front which not only draws cool air inside but also keeps your hands cool and dry. Among other features, there are fan speed dials, LED lights, extra USB port and two height levels which are common to most laptop cooling pads. Overall, Cooler Master Notepal x3 is the best laptop cooling pad for mid-sized gaming laptops. If you want something that can fit much larger laptops such Alienware etc, read further as I have listed those options too. If you’re wondering what else a laptop cooling pad can do except cooling, then Deepcool M3 is the perfect answer. It not only cools down your laptop but also doubles as a 2.1 channel audio system too. Amazing, right? Deepcool M3 is designed for wide range of laptops between 12 and 15.6 inches. It comes with a single yet efficient 140mm cooling fan fitted at the center which can run at speeds between 600 to 1100 RPM; good enough for optimal cooling. The fan speed can be adjusted easily allowing you find the perfect balance of effective cooling and silent operation. 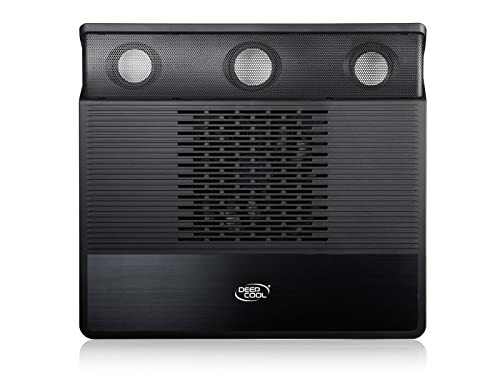 It is a bit expensive than other laptop cooling pads on this list but that’s because of the in-built 2.1 channel speaker system which is capable of regenerating 3D surround sound effect. There are two tweeters and one woofer to deliver a good audio experience. But again, it’s not a replacement of a standard gaming speakers. Apart from the sound and cooling, the Deepcool M3 also offers an ergonomic design with an angle of eight degrees. It comforts your back and spine from sprain due to working on laptop for long hours. There’s an extra USB port and AUX-in port for connecting the sound system. Overall, Deepcool M3 works well as a cooling pad and offers above average audio experience as well in an affordable price for the two things combined. 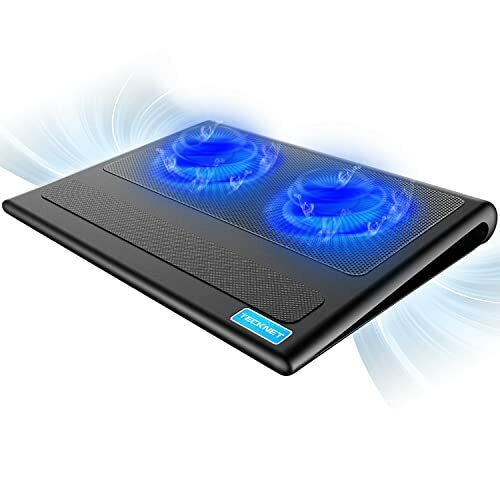 Here’s another one for extreme gaming performance – the TopMate 12 laptop cooling pad. After buying this unit, I am sure you cannot ask for anything more! TopMate 12 has massive 5-fan setup – one at the center and four at the outer corners. It can operate in three different modes as per the cooling requirements. First one with just the center fan running, the second mode being center fan off and other four fans running and the third one with all 5 fans beating the heat! If that was not enough to impress you, there a small LED display in the front that works as a control panel for this laptop cooling pad including options for power on/off, fan speed control and working modes. On top of all this, the fans can run at an impressive 2500 RPM providing extra airflow enough to chill your laptop to the coolest possible temperature. This one also has the same blue LED lighting. I don’t know what with the blue LED, every laptop cooling pad is giving it as if no other colors are left. Anyways, I hope there would be more options in the future. For height adjustment, there are five levels you can choose from as per your convenience. Apart from being ergonomic, TopMate 12 has an aerodynamic design for improved cooling. The only drawback with this laptop cooling pad does not support laptops larger than 15.6 inches in size. If you want a larger one, they have a 17-inch variant but it will cost you another $10 above the cost of this one. 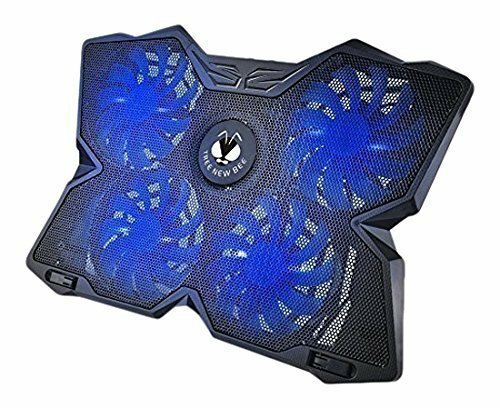 In my opinion, TopMate 12 has all the necessary features that makes it the most premium laptop cooling pad for gamers available in market in 2018. We al know that Thermaltake is a well-known maker in the computer cooling industry and one of their best cooling pads for laptops is the Thermaltake Massive 20. Frankly, I am more flattered by the design. With such minimalist shape, unique tapered edges and a sleek RGB strip running across the edges, Thermaltake Massive 20 is completely a delight to watch and gonna look absolutely eye-candy on your desk. The RGB lighting can be customised in 5 modes – Wave, RGB Spectrum, Pulse, Blink and Full Lighted. You can also set the color according to your laptop or gaming room color scheme. Thermaltake Massive 20 is literally massive as it can accomodate a 19″ gaming laptop with ease. For cooling, it uses a full-sized 200mm fan with adjustable speeds between 600 to 800RPM. The top panel is a large steel-mesh for supreme ventilation and durability. It also reduces wind resistance that reduces the operational noise to the minimum. Such a setup helps in preventing your laptop from overheating heating to a larger extent. The folks at Thermaltake have taken a special care of the ergonomics for increased comfort. There are three adjustable height setting to achieve a optimal screen position to best visual angle. To avoid slipping of laptop, there are two anti-skid levers on the top surface. The hexagon shape mesh is fairly large and has been engineered for reducing wind resistance and minimize the noise of the wind. On the side of the device, you’ll find two USB ports for some added freedom to connect additional USB devices. 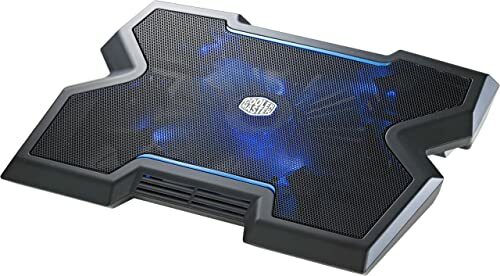 While everything else is pretty much great about the Thermaltake Massive 20 laptop cooling pad, the only disappointment is the plastic construction. It kinda makes it feel cheap which isn’t what you expect at this price point. Clearly, Thermaltake Massive 20 is a reliable laptop cooling pad for larger laptops. I recommend it as a smart choice who want the best of the both worlds – performance and looks. The next one in our list of best laptop cooling pads is the Targus Lap Chill Mat which is quite popular for its comfortable design especially for those who use these devices in their laps. That’s why they call it a “lap chill mat”. First off, it is meant for regular laptop usage like in offices etc. and not for extreme gaming. If you’re looking for something for your gaming laptop, you must look for other option on this list. 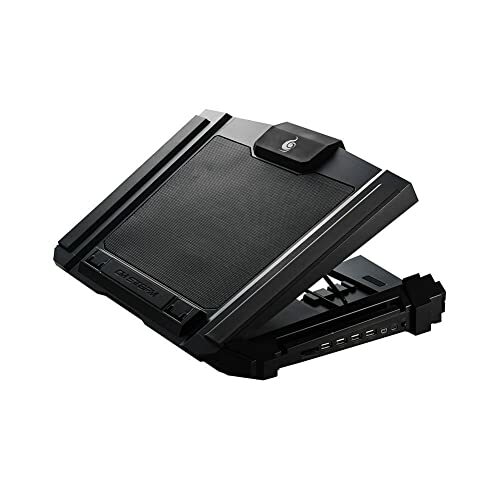 Targus has prioritized to provide comfort while using the laptops and along with that silently cooling your laptop. There exterior of this cooling pad is covered with a layer of soft neoprene for added comfort. It has an interesting hollow design that improves ventilation as well as makes it very lightweight. There are two fans for blowing cool air into the laptop to make sure your laptop runs at optimal temperature. On the top surface, there is four rubber holding that prevents the laptop from displacing. As far the size is concerned, it is meant for laptops lesser than 17 inches in size. I would recommend Targus Lap Chill Mat to the professionals who work for long hours with their laptop in their laps. No doubt, it is the best laptop cooling pad for professionals and office purpose. And finally, the heavy-duty cooling pad that some of you have probably been waiting for: the Cooler Master Storm SF-17. At first glance, the SF-17 is some that does not fit well on a clean and professional environment because its rugged and bit bulky design. That’s because it was designed to go with gaming laptops. But that doesn’t make it any less on performance. In fact, it is offers the maximum cooling efficiency by sacrificing a bit on the looks unlike the Thermaltake Massive 20. For maximum comfort, it has four different angles to choose. There are four extra USB ports to allow you attach more USB devices to your laptop. The best part about this laptop cooling pad is the two way power input. You can either use a Micro USB port to power it directly from your laptop or just use Mini USB port and the AC adapter to power it from the wall socket. If you ask me about it’s USP, I would say it’s the silent yet powerful 180mm fan which does a remarkable job when is comes to cooling. It can easily fit a 17″ laptop and keep cool even in the full load condition. It can completely support most modern gaming laptops making it the most efficient laptop cooling pad on this list, although it does not do well in the aesthetic front or the portability like other options on this list. If you’re looking for a more affordable option, the Tecknet FBA_49498 laptop cooling pad is a very fitting solution for all your laptop overheating problems. It’s compatible with a diverse range of portable computers, ranging from 12 to 17 inches, and one of its main strengths is the quietness of the fans. Some reliable ergonomic features are present as well. The build-up of heat inside your laptop can be a serious problem and despite this being an inexpensive cooler, it still offers good cooling performance. The pad is designed with a curved shape for better air circulation and there are two intake vents in place. This is called AirFlow Wave Design and another advantage of it is the quietness of the fans which shouldn’t bother you when working. There are two USB powered fans which measure 110 mm each and they come with a power switch. An additional USB port is also supplied for connecting one extra device to your laptop. There’s a LED indicator which will give you a clue regarding the status of the cooler. Thanks to an angled top and a raised rubber rim, your laptop is secure on any surface and it can be positioned with ease in the most comfortable spot. The grip pads on the bottom will offer some peace of mind if you’re worried about sliding. Those who enjoy traveling with their laptop can also benefit from the boost in performance provided by the cooling ability of this pad when they’re on the go. It has a lightweight and thin design which ensures maximum portability. Factoring in all these great features, it can be said that the Tecknet FBA_49498 can be a reliable companion for your sleek laptop. It’s fairly silent and well-designed without making you compromise on the cost. This is an excellent product for keeping your laptop cool so this is why it’s recommended. The last option that deserves some attention is the Kootek LCP04, a cooling pad which uses a system with one big fan and four smaller ones. This is an ergonomic unit as it permits adjustability in six height settings. There are some good qualities in this cooler so let’s see if it’s worth the money. The construction of this cooling pad is above the competition as it blends durability with a low weight. A metal mesh front is great for maximizing the airflow. A total of 5 fans can work together to cool down a heated laptop and it’s nice that the manufacturer included some options for customizing the process. For a more modern design, Kootek provides bright LEDs. You can have all the fans working at once or just the large fan and there’s also to option to have only the 4 smaller fans running. The independent control is also available for the blue LEDs which is a welcomed feature. Overall you can have some uniform cooling with this model. The fans are reasonably powerful yet they maintain an acceptable level of noise creating an interference-free working environment. A dual USB hub has been integrated so you won’t need to sacrifice the USB port of your laptop for the cooler as you’ll gain it back. The only slight drawback is the USB cord which is not of a great quality and seems prone to breaking. A total of six height settings provide a good variation for the viewing angles and a set of sturdy stoppers should keep the laptop in place without any issues. It can keep cool various models of portable computers as long as they fit within the 12” and 17” diagonal sizes. The price for the Kootek LCP04 is quite high but it’s justified if you factor in all its solid features. It does a satisfying job cooling any heated laptop so it’s worth a shot if you’re in the market to get a good all-around laptop cooling pad. Guys, I can understand it’s not that easy to make choice when so many good options are available. Let me help you out here. Before you decide about the laptop cooling pad you want to buy, first zero down on your requirements and a few important things that determine the performance of a cooling pad. See, all the laptop cooling pads listed above or the ones you will find in the market are going to cool down your laptop. But “to what extent” is the differentiator between a good laptop cooling pad and an efficient laptop cooling pad. For a rough calculation, the number of cooling fans is a factor to estimate the cooling efficiency but technically the CFM rating defines the air flow which is the actual indicator of cooling efficiency. Generally, most single and double fan laptop cooling pads have 50-70 CFM rating while those with more than 2 fans have CFM rating up to 80. In end, it’s pretty simple – more value of CFM equals more cooling. Even the best laptop cooling pad, if not designed ergonomically, can leave you in pain. So, make sure the one you choose should be ergonomic and have options for adjusting height and viewing angles. The whole laptop cooling setup works on just one thing – Air Flow. And for that, there should be proper vents for air intake. Apart from the number of vents, keep an eye on the location of vents as well. Most of the aerodynamically designed pads like Cooler Master Notepal X3 have multiple vents located along the edges and the bottom for superior cooling. One advantage of using laptops over a PC is that laptops are silent. And, I am sure you would not want to have a disturbing noise from the fans of the laptop cooling pad. To be very honest, with large moving fans, it is not easy to have a practically silent laptop cooling pad. But with better quality fans you can have very insignificant noise which is okay. Just a quick heads up about the gaming laptop cooling pads is that they cannot be silent. 1. Switch Your Power Plan: Depending on your operating system, there are options for tweaking your power settings. While doing regular stuff on your laptop make sure you switch to the “balanced” or “power saver” mode. Only use the “Performance” mode when it is needed like while playing games or rendering a video etc. If you’ll run your laptop in “Performance” mode all time, it will make the processor work at the maximum potential thus generating more heat. 2. Remove the Dust: Use dust remover spray to clean the laptop’s vents. Dust accumulates in the laptop’s fan vents— a problem easily solved with a can of compressed air, usually less than $10. Turn off your laptop and spray the vent to remove the dust. 3. Use a Cooling Pad (Obviously! ): Use a laptop cooling pad that has a fan or two. Laptop pads that have vents but no fans can also increase the airflow around your laptop but for stronger cooling needs, a fan is the best way to go. I’ve personally used the Cooler Master Notepal X-Slim (under $30) and been happy with it, but there are several other options that I have mentioned already. 4. Keep your Room Cool: Keep your working environment or computer room as comfortably cool as possible. Computers, like most people, work much better in air-conditioned environments. Most server rooms or data centers operate at 70 degrees Fahrenheit or less, according to Server Fault, and that seems like an ideal temperature recommendation for home offices as well. 5. Shut Down When Not in Use: Shut down your computer when it’s not in use, and especially when you are not at home. The last thing you need when you get home is to find out your laptop was a fire hazard—one of the dangers of overheating laptops. That’s all folks! It’s time to wrap up this round-up of best Laptop Cooling Pads. I hope you have got an idea about why a laptop cooling pad is necessary and what are some great options out there in the market. I personally tried to include variants of laptop cooling pads supporting different sizes and budgets and hope that you must have found the best laptop cooling pad for yourself. To conclude, I would like to highlight my choices for laptop cooling pads. If you are looking for the beast of cooling performance, just buy Cooler Master Notepal X3 or Storm SF17, both of them are the best laptop cooling pads for gaming. For those looking for an office usage option, go with Targus Lap Chill Mat or the Notepal X-Slim. For my friends who are on a budget, I would recommend Tecknet FBA_49498 which is the most affordable laptop cooling pad of 2018. Well, if you have any suggestions about the laptop cooling pads or any secret tip for cooling laptops, please share with me in the comments section. If you found this article helpful, please share with your friends on social media. For more gaming product reviews, stay tuned to Glinkster!